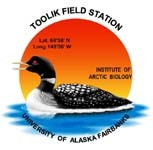 » Daily summary of 10 cm soil temperatures in the Arctic LTER moist acidic experimental plots from 1998 to present, Toolik Lake Field Station, Alaska. Definition: Control soil temperature at 10 plus or minus 3 cm. Since the probes sometimes changed depth with frost heaving only data with probes within 3 cm of 10 cm of soil surface were used. Definition: The control temperature probe used for the daily average. In the original data logger files the 10 cm probes are labeled CT1 10 cm and CT2 10 cm. Definition: Greenhouse soil temperature at 10 cm plus or minus 3 cm. Since the probes sometimes changed depth with frost heaving only data with probes within 3 cm of 10 cm of soil surface were used. Definition: The Greenhouse temperature probe used for the daily average. In the original data logger files the 10 cm probes are labeled GH1 10 cm and GH2 10 cm. Definition: Greenhouse NP soil temperature at 10 cm plus or minus 3 cm. Since the probes sometimes changed depth with frost heaving only data with probes within 3 cm of 10 cm of soil surface were used. Definition: The greenhouse NP temperature probe used for the daily average. In the original data logger files the 10 cm probes are labeled GHNP 10 cm and GHNP2 20 cm. There is no GHNP 10 cm. Definition: Control soil temperature at 10 cm plus or minus 3 cm. Since the probes sometimes changed depth with frost heaving only data with probes within 3 cm of 10 cm of soil surface were used. Definition: The NP (fertilized) temperature probe used for the daily average. In the original data logger files the 10 cm probes are labeled NP1 10 cm and NP2 10 cm.